They say abs are made in the kitchen, but that doesn’t mean all exercise is in vain. Whether you’re craving washboard abs or just a little less pooch, a healthy diet and regular workout routine will help you get there. If getting excited about crunches is a challenge for you, you’re not alone, but luckily, there are other ways to go about getting a flatter tummy. Yoga provides a dynamic method for toning and strengthening the abdominal muscles while enhancing overall balance and flexibility. Skip the crunches and move mindfully through the 14 poses listed below to unveil the true power hidden in your core. Here’s everyone’s favorite exercise, well not really, but it’s crazy effective for toning the core. In addition to its ab-building properties, plank pose also works the back, legs, and arms. Come to all fours with knees stacked under hips and wrists under shoulders. Spread the fingers wide and firmly root through the thumb and index. Extend one leg at a time straight back, keeping the core engaged and the back aligned. Let your gaze travel approximately a foot ahead of the fingers to bring space to the back of the neck. Stay engaged and avoid sagging through the back or letting the sit bones lift too high. Hold for 30 seconds to a minute. If you’re feeling a full-body burn, you’re doing it right! 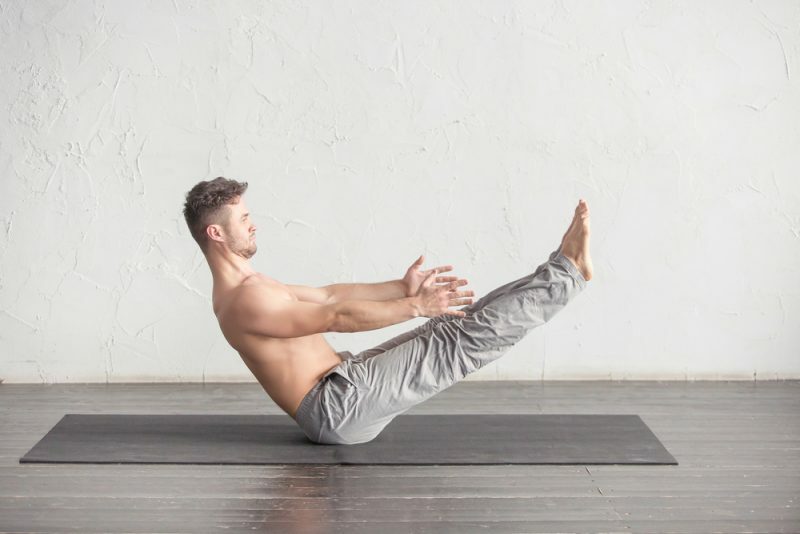 Not quite the same as a relaxing boat ride, but you’ll be thankful when you see the results this pose has on your belly. Find a comfortable seat with knees bent and feet planted at hips-distance. Keep the spine long and straight while opening across the collarbones. Bring the arms parallel to your mat with palms turned in and shoulderblades drawing together. From here, start to hinge back on the sit bones, finding a flat space where balance is possible. Keep engaging the core as you inhale the feet from the floor, bringing the shins parallel to the mat or straightening the legs out for a greater challenge. Remain here for 5-10 cycles of breath, incorporating leg dips or russian twists for an extra kick. Also referred to as ‘airplane pose,’ this balancing act ignites the mid-section by challenging the core stabilizer muscles. Not only that, but it’s great for sculpting the legs and booty. 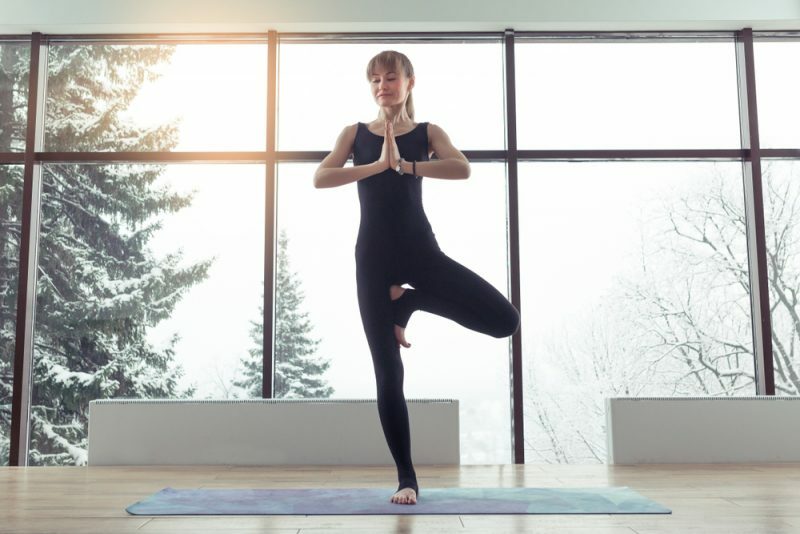 Standing tall with feet at hips-distance and arms by your sides, take a deep breath in while slowly raising the arms overhead and shifting weight into the right foot. As you exhale, hinge forward at the waist and envision the upper body and left leg becoming parallel to the floor. Notice the line of energy stemming from the fingertips and running along the entire back body through the left foot. Keep the whole body activated as you take 3-5 breaths in this shape. When the muffin top situation gets a little out of hand, side plank comes to the rescue. This tricky alternative to a regular plank targets the entire core, especially the obliques. From a standard plank position, slowly transition onto the knife edge of the left foot and rest the right leg on top. Use a deep inhale to lift the right arm straight up while stacking the hips and drawing the belly button inward. If it’s comfortable on the neck, shift your gaze to follow the right hand. You can modify by bending the left knee and bringing it to the ground as additional support. Hold for as long as you can on each side, being mindful of your alignment as the muscles step up to the challenge. Just as the name suggests, this pose involves moving the legs side to side to stimulate the core muscles. Start by lying on your back with knees bent, feet flat, and arms straight out in a T-shape. Inhale the feet off the floor, bringing shins parallel to the mat and knees over the hips. Root the shoulders and lower back down while pressing firmly through the hands. On a breath out, drop the knees to one side, moving mindfully to stay active in the core. Inhale to bring them up through the center and repeat on the other side. Repeat 3-5 times per side, remaining connected to the breath and noticing how it influences the movement. A large part of working our mid-section involves giving it a good stretch from time to time. Camel pose helps tone the core while maintaining flexibility in the front and back sides of the body. You’ll feel a great stretch in the quadriceps, and abs, which will feel particularly amazing if you’re getting sore from all these challenging postures. From a kneeling stance, tuck the toes under and align the hips over the knees. Inhale to find some length through the spine, and exhale to lean back while gently reaching for the ankles. If that feels too intense, try bringing blocks to the outside of the ankles for the hands to rest. As you breathe in this shape, keep the pelvis reaching forward and the neck neutral. Balancing postures encourage us to draw everything towards the midline in order to stabilize the body and locate our center. This sense of stability can fluctuate from day to day, but it’s important to stay mindful through the wobbles. Tree pose is the perfect form for testing our balance while offering several variations to meet any needs. Start standing with weight shifting slightly into the left foot and hands at heart center. On an inhale, draw the right foot up to the left inner thigh, calf, or ankle. Pull the belly button in and bring your right knee back to open the hips. Test your balance even further by taking your gaze towards the ceiling. Stay here for several long and even cycles of breath. Many underestimate the core-sculpting power of this popular yoga pose. While the back line of the body is being stretched and released, the core is busy supporting the shape. Come to a tabletop position with the hands slightly forward of the shoulders and toes tucked. Inhale to hover the knees roughly an inch from the ground, and exhale to send the hips up and back while straightening the legs. Pull the navel into the spine and continue to breathe here for 5-10 full rounds. Throw in some alternating leg lifts or knee dips to increase the difficulty. Don’t be fooled into thinking all the power of flight comes from the arms; there wouldn’t be any liftoff without a tremendous deal of core strength. Enter crow pose by starting in a low squatting position with both hands on the mat in front of you and fingers spread wide. With the knees resting high on the arms, rise up on the balls of the feet as you slowly shift your weight over the wrists. Firm through the core to allow the feet to lift from the floor, pulling them close to the sit bones. Set your sights high by keeping the gaze directed forward rather than down and breathe for 3-5 rounds. Dolphin pose is kind of like downward dog’s crazy intense cousin, extending many of the same benefits with a little extra kick. This shape works the abs while increasing flexibility in the hamstrings and calves. Start in a traditional downward facing dog and slowly lower to the forearms on an exhale. Keep the arms parallel and isometrically pulling back to expand across the collar bones. Try to maintain this pose and relish in the difficulty even when your body tries to quit. If you’re feeling extra ambitious, turn up the heat by adding in some alternating leg lifts! Half moon isn’t all about lunar serenity, in fact, it’s one of the trickiest balancing postures around. To enter this pose, find triangle pose with the right foot forward. Bring your left hand to the left hip as you slide the back foot in about 8 inches. Bend the right knee and begin to reach the right fingertips roughly a foot ahead of the toes, using a block if necessary. On an exhale, simultaneously straighten the right leg and lift the back foot from the floor. Extend the left leg straight from the hip and reach the left hand towards the ceiling, bringing the gaze up for an extra challenge. Feel the hips stacking and the core pulling in to bring a sense of stability. Hold for 2-5 breaths before repeating on the other side. Embody the spirit of the moon by shining through all four limbs and radiating your energy outward. This pose is about much more than geometry and requires more abdominal strength than brain power to achieve. You’ll notice a rejuvenating stretch in the legs while your core gets fired up. Start standing at the head of the mat and take a wide step back with your left foot. Align the front heel to the back arch as you extend the arms out in a T-shape. Gaze beyond your right fingertips while exhaling to hinge forward. Reach as far as possible with the right hand before dropping it to your front shin or a block. Move the left hand straight up, letting the gaze follow. Press firmly through the knife edge of the left food to stack the hips and tighten the core. Stay for 3-5 breaths before repeating on the other side. This pose is notorious for its glute-lifting qualities, but don’t forget about the core power it takes to send the hips skyward. In addition to building a strong physique, it stretches the muscles of the abdomen and the quadriceps. Come to lie on your back with knees bent and feet planted at hips-distance. You should just be able to graze the heels with your fingertips. Root the palms down by your sides and press through the feet to raise the hips on an inhale. Shimmy the shoulders under, interlacing the hands and pressing the forearms down. Keep the airway open by bringing space between the chin and chest. Stay for 5-10 breaths before rolling the spine back down to the mat. Just like traditional plank pose, this shape brings benefits for the whole body. Not only are the abs lengthened and strengthened, but the glutes and legs as well. Find a comfortable seat with legs straight out in front and toes pointed. Plant the palms behind the hips with fingers facing forward and a straight spine. From here, press firmly through the hands to lift the pelvis up on an inhale, bringing the soles of the feet to the mat as you engage the leg muscles. Find power in the front and back lines of the body as you sustain this pose for 5-10 breaths.